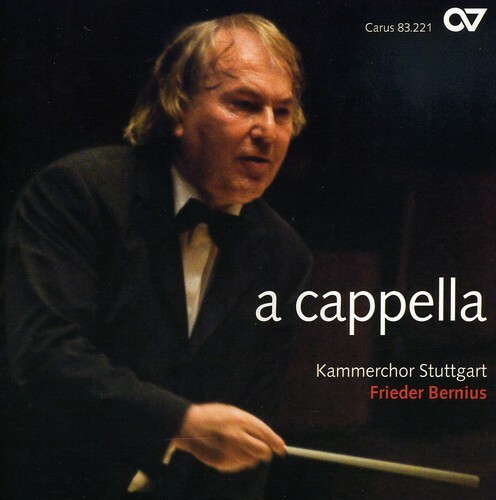 Although it's hard to tell from the cover, this is a compilation of music from six discs by Germany's Kammerchor Stuttgart, under longtime conductor Frieder Bernius. It's a good pick for those interested in this 18-member a cappella group, or in unaccompanied choral music generally; the Stuttgarters must rank among the world's best mixed-gender adult choirs in the sheer consistency and suppleness of their vocal blend. The seven Mendelssohn psalm settings and small vocal works included here are drawn from the group's multi-disc complete recording of Mendelssohn's sacred music, and the works performed here are fine samples that illuminate a largely forgotten repertory and may inspire many buyers to go in search of the original recordings. Beyond Mendelssohn you get good examples of other aspects of the group's work: music by an unfamiliar composer (Gottfried August Homilius), some favorites of the later nineteenth century by Brahms, and some black-belt pieces from the end of the century: hear the tonal consistency at a punishingly high pitch of the Sanctus from Rheinberger's Cantus Missae, Op. 109 (track 13), and marvel. No original recording dates are given, but the recordings must span a considerable length of time; the choir has been in existence since the mid-'80s, and the Mendelssohn project alone involved 12 CDs. Given this, the remastering job is impressive; the sonic ambience is consistent and never less than clear and warm.